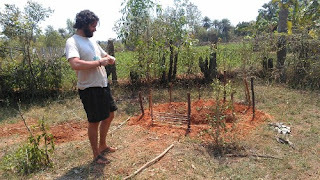 This is a volunteer community project to fix, maintain and improve the "Integrated Animal Care Center, Auroville" so it can continue to care for stray dogs and other animals. So far all fruit and vegetable discards were going around trees which was a messy situation and cooked food discards were being dumped in an unused field. Now that we have fenced compost pits in making (we don't want our puppies getting in there and getting stuck! ), we can turn a messy situation into compost for our planned herb garden. With these pits we have just scratched the surface of how waste is handled at IACC. There is still the matter or handling paper and plastic waste, handling dog poop and minimizing the strain on the septic tank. 4 new puppies. Our youngest so far! A project by Bharti Foundation. Simple theme. Powered by Blogger.